Travertine specials - for a limited time! 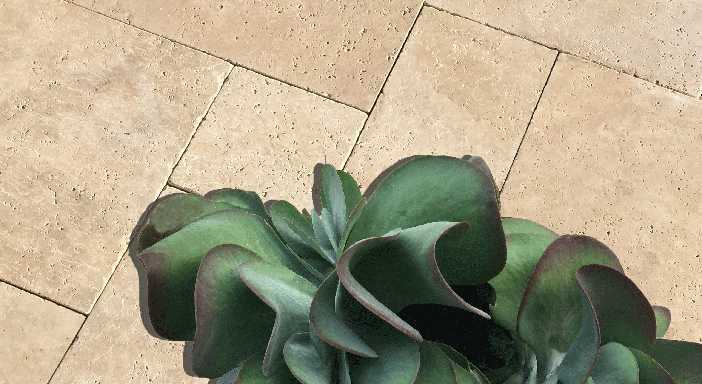 Welcome to Travertine Mart®, the fastest growing online retailer and wholesaler of travertine tile and travertine pavers. We offer extremely low wholesale prices on Premium Grade Turkish travertine pavers, travertine tile, patio pavers, travertine pool coping, pool deck pavers and marble pavers. At Travertine Mart, your order is backed by our 1-Year Limited Warranty and 31-day Money Back Guarantee. If you change your mind about your order, send it back to our warehouse – no questions asked. We are also Better Business Bureau accredited, you can view our rating here. 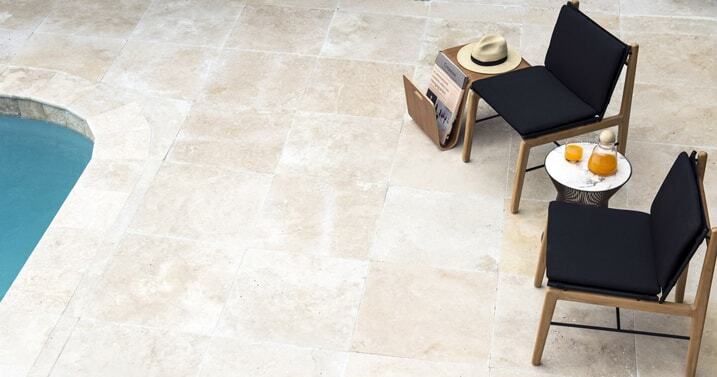 Our promise is that you will always be treated with honesty, integrity and respect when dealing with Travertine Mart. 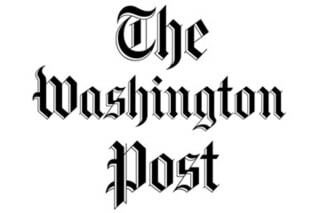 WE SHIP NATIONWIDE, directly to your home or business. 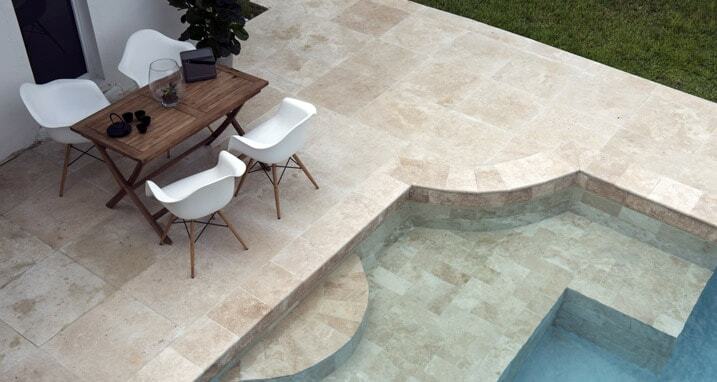 Travertine is a porous stone and it provides a natural non-slip surface – an excellent choice for pools, patios and decks as stone pavers. Travertine Mart recently started offering another industry breakthrough by offering a 1-Year Limited Warranty for Premium Select Travertine Pavers and Travertine Pool Coping. This 1-Year Limited Warranty covers freeze/thaw damage as well. Our ASTM Testing (American Society Testing Materials) shows that Travertine Pavers are freeze/thaw compatible in colder weather climates. 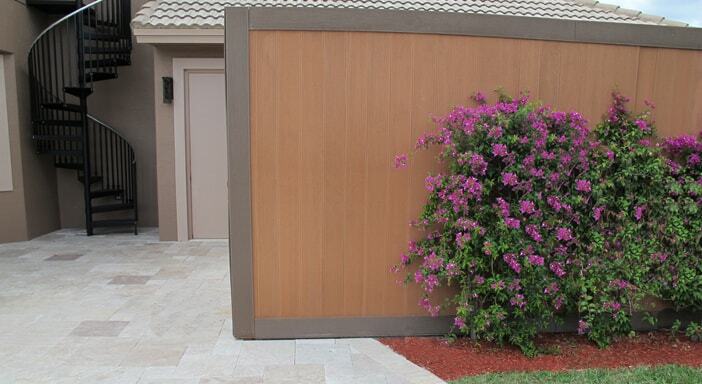 The same test results also show that our tumbled travertine pavers have a higher grip when wet. They are considered “Conditionally Slip-Resistant” meaning that if no other factors come into play, only Travertine and water, it is slip-resistant. 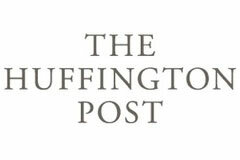 Many cities and counties nationwide consider 0.6 as the minimum to be called “Slip-Resistant. The results can be seen under co-efficient of friction section on the product pages. 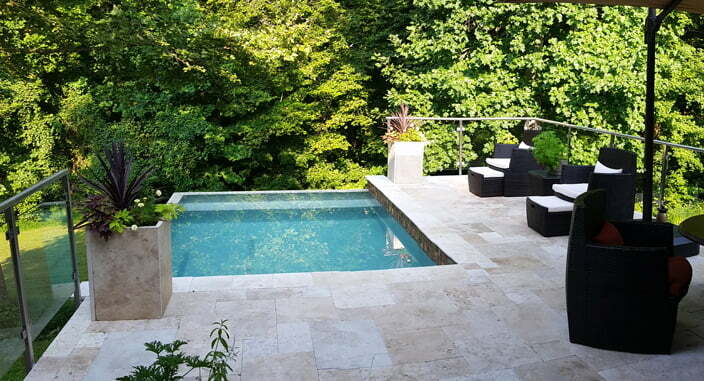 Travertine pavers are recognized as ideal pool pavers, patio pavers, pool tiles and pool deck pavers by architects, interior designers, pool builders and paver installers mainly due to their heat resisting ability, slip-resistance and apparent beauty. Especially the lighter colors of travertine pavers will provide a pool deck surface that will stay cool even in the hottest summer days. 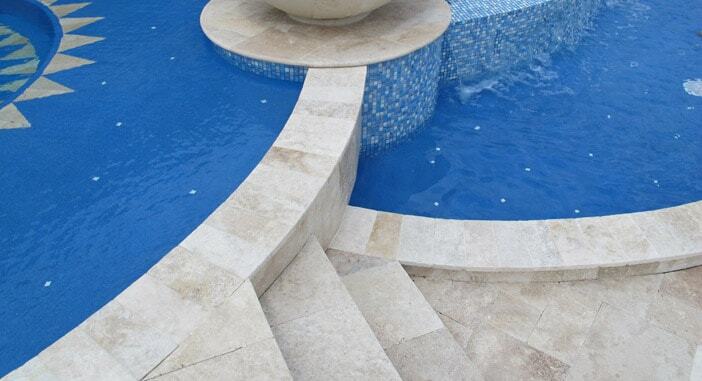 Travertine pool coping is also ideal for the edges of a swimming pool. 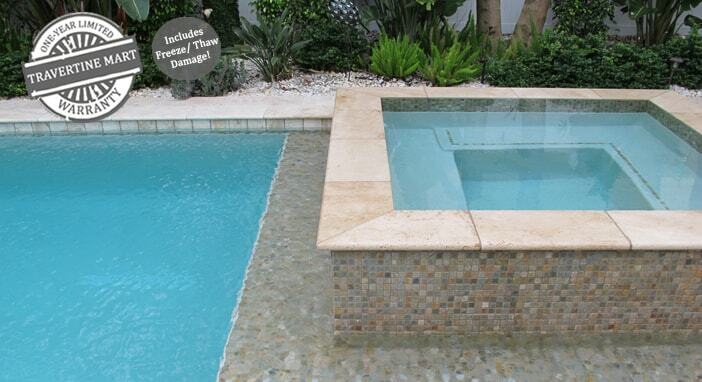 We provide 1.25″ and 2″ thick travertine pool coping. We also carry travertine remodeling pool coping which can be laid easily on top of your existing pool coping for remodeling projects. Travertine installation is easy, refer to our installation page, which explains how to install travertine tile, travertine pavers and travertine pool coping. We offer excellent transportation deals for New York, New Jersey, Georgia, Louisiana, Texas, Virginia, Massachusetts, North Carolina, South Carolina, Illinois, Maryland, Tennessee, Alabama, Pennsylvania, Indiana, Ohio, Connecticut, Kansas, Kentucky, West Virginia, Rhode Island, Michigan, Wisconsin, Oklahoma, Mississippi and throughout Florida, including Tampa, Fort Lauderdale, Boca Raton, West Palm Beach, Miami, Jupiter, Jacksonville, Orlando and Pompano Beach. Need a full container? No problem! We can ship directly to your nearest port. Order Samples and Request Estimates online 24-hours a day. Questions? Chat Live or Call Us Toll-Free to speak to one of our helpful Product Specialists at (800) 556-9720 We hope that you will choose Travertine Mart® for your travertine flooring needs and enjoy our premium quality products coupled with impeccable customer service.